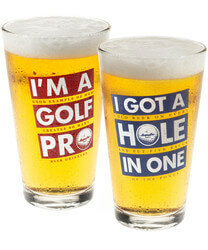 Each Golf Pint Glass features a simple message written in large print. But read between the lines and you'll reveal its true meaning. "I Got a Hole in One" becomes "I Got a Cold Beer on Every Hole and Put 5 Balls in One of the Ponds" and "I'm a Golf Pro" becomes "I'm a Good Example of How Golf Creates So Many Pro Beer Drinkers". These clever, dishwasher safe glasses hold 16 ounces of delicious beer (or whatever beverage tickles your fancy).